03/22/09 W73. 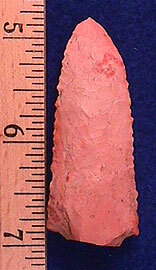 (W66) SOLD Adena, 2 3/4", TN, mottled light red and pink, thin with creek-stain, ancient impact fracture on tip, $10. 03/22/09 W74. 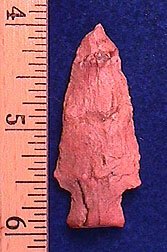 (W67) Woodland point (not sure of the type), 1 15/16", TN light red and pink, needle tip, $10. 03/22/09 W75. 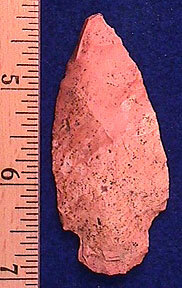 (W68) Little Bear creek snapped base, 2 3/16", TN, light pink, killer edge work, point is much nicer that the photo, $12. 11/30/08 W76. 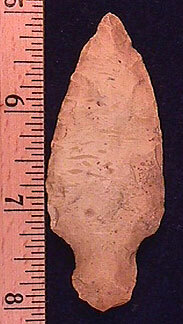 (W70) Adena, 3", KY, golden brown Ft. Payne, ex-Ken Partain, pretty, $25. 11/30/08 W77. 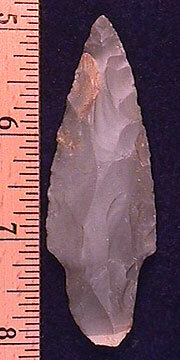 (W71) Adena, 3 1\8", KY, hornstone, ex-Ken Partain collection, lightly ground stem, pretty point, $35. 11/30/08 W78. 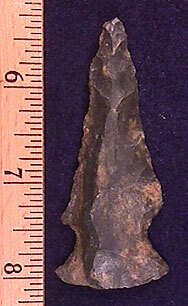 (W72) Adena, 3 1\16", AR, black with brown inclusions, ex-Ken Partain collection, $15. 07/02/08 W80. 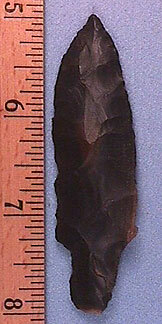 (W74) HOLD Hopewell, 2 13\16", OH, black and tan material, ex-Vietzen collection, killer base, $49.